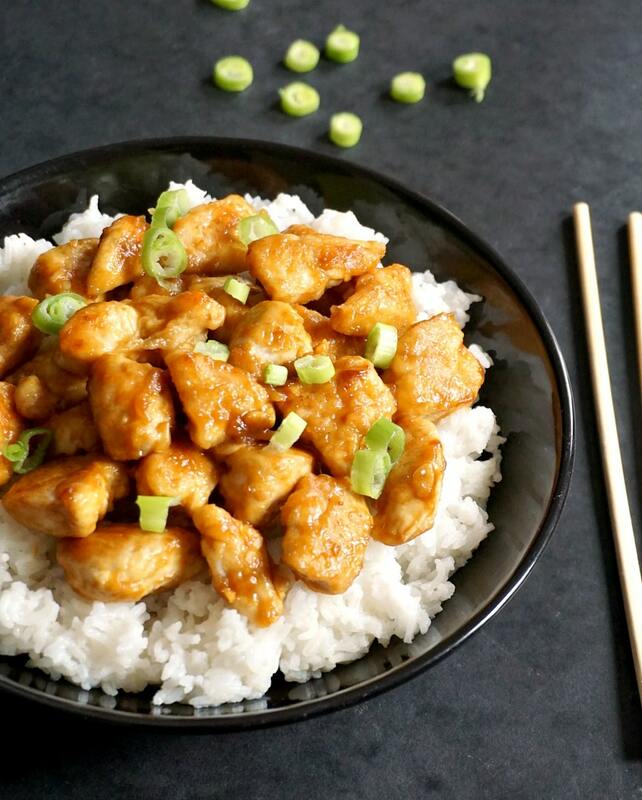 Healthy Chinese Orange Chicken, one of my top 10 Chinese dishes that l could have any time. Tender chicken coated in a zesty orange sauce and garnished with spring onions. Ready in well under 15 minutes. Serve it with rice, and you have the most delicious dinner recipe. I’m back with more healthy chicken recipes for dinner, again with a nice Asian kick. 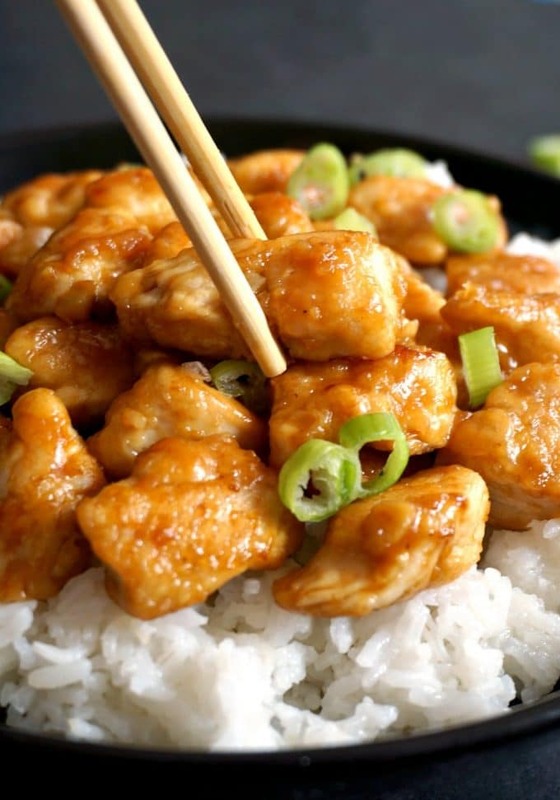 This time l have one of the most popular take-away recipes, the one and only, super easy and healthy orange chicken, Chinese style. The orange and chicken combination didn’t use to sound too appetizing to me a while back, but l decided to give it a go anyway, and l just loved it. l mean, yeah, there’s the oh-so-posh Orange duck recipe that fancy restaurants like to have on the menu, but chicken? Yup, and it’s delicious. While l’m not touching duck meat for the rest of my earthly existence, and that’s because of some childhood issues l had with the aforementioned meat (basically mum kind of getting me to eat duck soup when l absolutely hated it, yuck), l’m more than happy to always experiment with chicken. Not quite sure l used to like it too much either, l have a feeling l was a difficult spoilt brat who used to fuss about food. And now there’s me moaning that my eldest girl is a picky eater. I wonder whom she got it from. Before I cooked this dish, I used to think my favourite was the Sweet and sour chicken ,but now l’m not quite sure. Both have a distinct flavour that makes you want more. And both are great with rice, but you can go for noodles as well if you want to. The first time l made it, l drenched the chicken pieces in beaten egg first, before coating with corn flour. I thought the chicken was a bit heavy, so I decided to ditch the egg,and just use the corn flour. And that really made a difference, the chicken pieces are a lot lighter, and the orange sauce sticks a lot better to them. No need to marinate the chicken for too long either, about 5 minutes or so should do, but, of course, you can marinate it for longer. It can make no harm, on the contrary, the longer you leave to marinate, the more flavour you get. Use freshly-squeezed orange juice if you have oranges, and mix in the orange zest too, otherwise just some store-bought orange juice is absolutely fine. I always buy the one with bits, it feels a bit more like the real deal. I can’t even remember the last time l had a Chinese take-away, it must have been a while back. I do remember though that the chicken was pretty greasy. Why would you use tons of oil anyway? 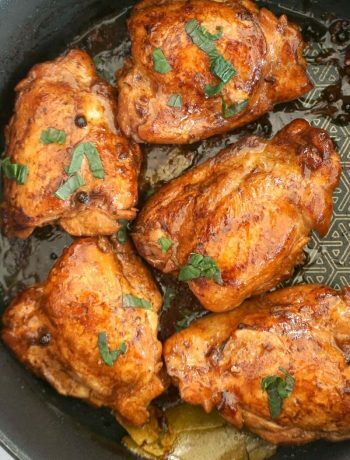 The chicken can cook perfectly well with just a tablespoon at the most. Just flip it on the other side after 2-3 minutes, and it cooks through super quickly, especially if the chicken pieces are smaller. The sauce is always added after the chicken is cooked, never ever at the same time. If you want some extra flavour, add more garlic and ginger to the marinade, and also fry some gently for about 30 seconds before the chicken goes back to the wok. I noticed little one is more willing to eat something that has some good garlicky flavour, than plain food. Mummy’s girl for sure. She didn’t want to try my orange chicken though, she woke up on the wrog side of the bed at that time, and decided to be whingy like a proper diva for most of the day. Toddlers, hey! And here’s you have, my amazing Chinese orange chicken, do give it a try! 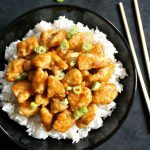 f you’ve liked my HEALTHY CHINESE ORANGE CHICKEN or any other recipe on the blog then don’t forget to rate the recipe and let me know how you got on in the comments below, I love hearing from you! You can also FOLLOW ME on FACEBOOK, and PINTEREST to see more delicious food and what I’m getting up to. 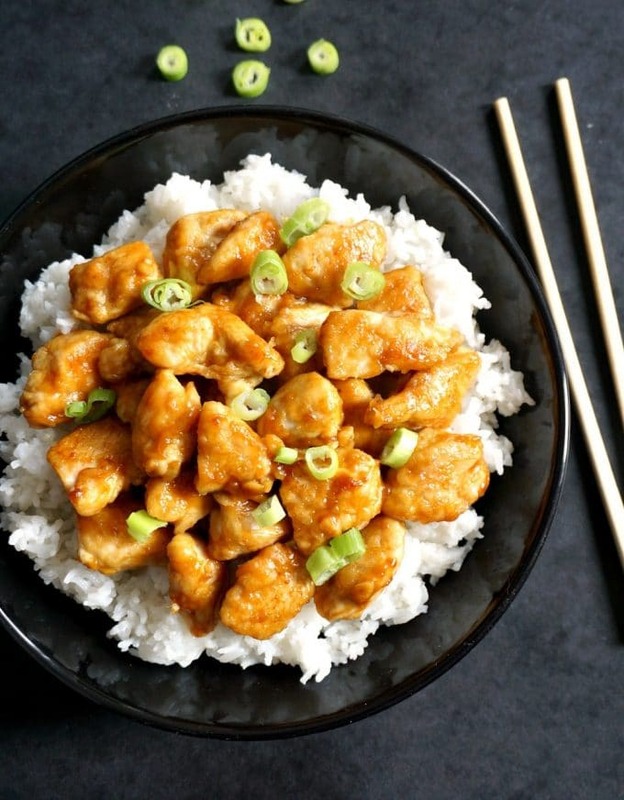 Healthy Chinese Orange Chicken, one of my top 10 Chinese dishes that l could have any time. Tender chicken coated in a zesty orange sauce and garnished with spring onion. Ready in under 15 minutes. Serve with rice, and you have the most delicious dinner recipe. 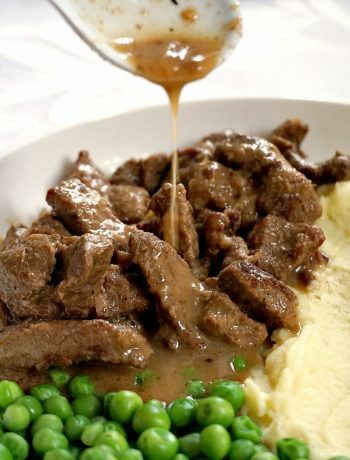 Mix together a quarter of a cup of orange juice, one teaspoon of dark soy sauce, one teaspoon of light soy sauce and one teaspoon of rice vinegar. Discard of the marinade, and coat each piece of chicken with corn flour, shaking off any excess flour. Heat up the vegetable oil in a wok over a high heat, add the coated chicken pieces and stir fry for about 2-3 minutes on each side, until lightly brown and cooked through. Cut the spring onion finely, and add the white part to the wok together with the remaining garlic and ginger. Stir fry for about 30 seconds, then add the chicken back. To make the orange sauce, mix one teaspon of corn flour with one teaspoon of cold water and stir well to get a lump-free mixture. Add it to a bowl together with the remaining orange juice, soy sauces, sesame oil and rice vinegar. Mix well to combine. Pour the sauce over the chicken pieces and stir fry for about a minute, so that the sauce can cook and stick to the chicken. Serve with the green bits left from the spring onion. Thank you, Ronit! It’s indeed a lot lighter, and healthier too. I hope you’ll like the recipe if you try it. I rarely eat Chinese out and prefer to cook my own healthier recipes. They are not only less greasy but salty as well. I would have to agree orange versus sweet and sour would be a toss up! I don’t think it’s a good idea to visit this post while I am so hungry! 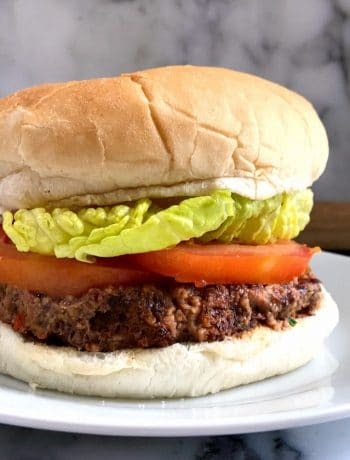 This looks super delicious! Thanks for sharing! Looks even better than takeout! Thanks for sharing at Fiesta Friday!